Hopping on your motorcycle and heading out on the open road is always the start of an exhilarating adventure. But riding a bike poses far more risks than driving a car. In order to stay safe, motorcycle riders should invest in a full set of safety gear. A motorcycle helmet is a key part of staying safe. However, finding the right helmet can sometimes be a real head-scratcher. What features of a helmet are important? What should the helmet be made from? How can you tell if the helmet will actually keep you safe in the event of an accident? If you’re shopping for a bike helmet, you’re definitely in the right place We’ve created a list of the best motorcycle helmets for 2019 which you’ll want to consider. Plus, we’ve created a complete guide to help you pick the best lid for your head. How Do You Know if a Helmet is Safe? How Do I Find the Right Size Helmet for My Head? Should a Helmet be Replaced After an Accident? A full-head helmet with retractable sun-visor, removable front mask and unique Advanced LG Polycarbonate shell. ScorpionExo helmets stand out from the crowd due to their unique shells made from Advanced LG Polycarbonate. Able to safely disperse force on impact, these helmets are also extremely lightweight. Plus, the field of vision is superb here. A retractable sun visor helps reduce eye strain. The visor is a dark smoke but can be swapped out with a clear one for night riding. The front mask is removable. Remains securely attached with neodymium magnets but can also be easily taken off. Note that removing the face plate does decrease the overall protective capabilities of the mask. With a flip-up dual visor, this ILM helmet provides plenty of protection but also allows you the freedom to expose your face when needed. A modular helmet provides the protection of a full helmet but allows gives you the option of lifting the visor up. 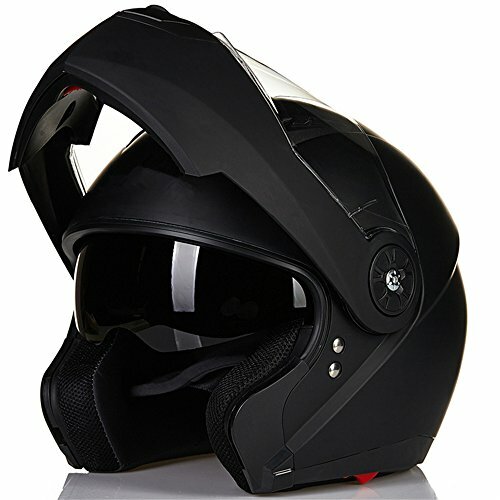 Often a good choice for riders of sport bikes with have a built-in face shield. The outer shell is made from tough ABS plastic with an EPS inner liner designed to absorb additional impact. Helmet is DOT certified. Includes both smoky and clear flip-up visors for safe riding in any light condition. The lightweight design dramatically cuts down on wind noise, too. Additionally, the helmet liner and cheek pads are easy to remove for washing. Helmet has a sleek design with plenty of options to suit your personal style. Available in blue, red, carbon fiber, gloss black, matte black and more. Stay in touch with your riding group thanks to the built-in Bluetooth intercom system which allows easy communication up to 1640 yards. Riding your bike is more fun with friends. 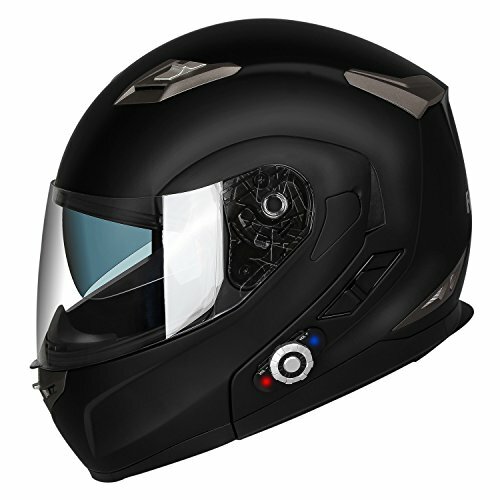 This full-face helmet from FreedConn includes a built-in Bluetooth system for quick and easy communication. Also allows you to connect a cell phone, music player, GPS system or basically any other Bluetooth compatible device. One button control lets you operate all devices safely even when on the road. The ABS shell is lightweight with an advanced ventilation system. You can still feel the fresh air when riding, but without any sacrifice in safety. Also includes cheek pads and liner for additional protection and comfort. Helmet is both DOT and ECE certified. Looking for a helmet with authentic style? 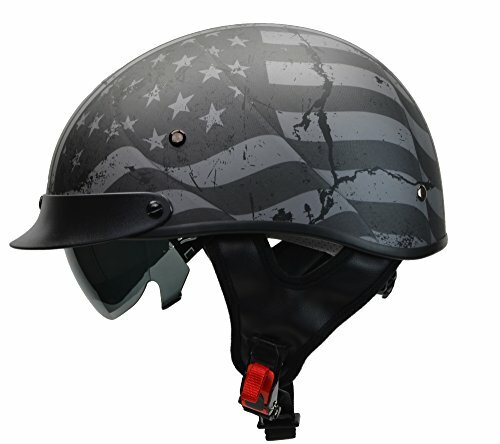 This half-helmet from Vega features a patriotic, black-and-gray flag design sure to impress and even intimidate. This half-helmet includes a drop-down sun shield which doesn’t just increase visibility but also protects your eyes and face from bugs and road debris. 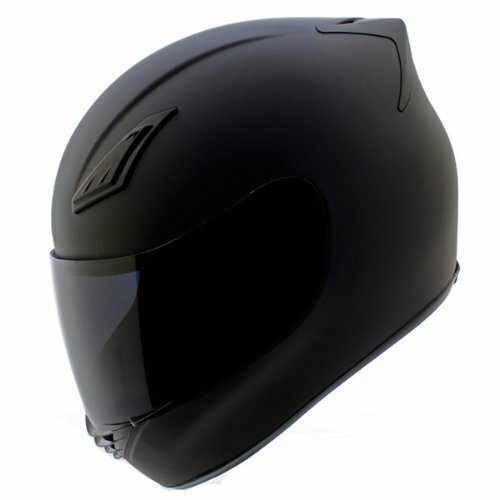 While not offering the same level of protection as a full-face helmet, it is lightweight, comfortable and DOT certified. Plus, the helmet is packed with features including a size-adjustment dial, advanced moisture wicking, a quick-release strap and more. Of course, you can’t ignore the bold design. Described as a Rebel Warrior Skull Cap, the illustrated American flag is sure to turn heads as you ride down the street. A cool, bold look which will also keep you safe. Suitable for cruisers, choppers, ATVs and other two-wheeled vehicles. Includes a robust five-year warranty. 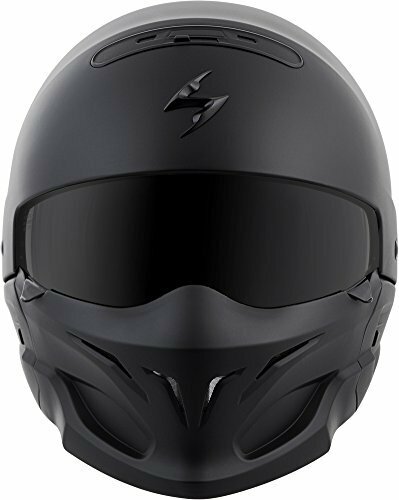 Aerodynamic and sleek, this lightweight poly-alloy full-face helmet keeps you safe even when riding at high speeds. Sleek, cool and ready to ride. This is the most popular helmet sold from manufacturer GDM. The DK-120 is a flush-fit full-face helmet made from an advanced poly-alloy. Inside cheek and liner nylon pads are soft, comfortable and hypo-allergenic. Helmet stays ventilated and comfortable even during long rides on hot days. Seven points of ventilation allow airflow to reach chin, cheeks and even behind the head. A wide, dark faceplate allows for a wide field of vision while also protecting your eyes from sun glare. Plus, the helmet is also scratch resistant. There are rounded helmets with a full faceplate. These are similar to full-face helmets with additional chin and forehead protection. These cover the top of the head and the front of the lower face but are otherwise open. These are similar to full-face helmets but the front part can be lifted up. This covers the entire head except for the front, which is open. The shell is the outside part of the helmet. While the interior filling also plays an important role (we’ll get to that later), the shell is a major factor in the helmet’s weight, safety rating and comfort. Polycarbonate – This is the least expensive material. It absorbs energy by flexing. Fiberglass Composite – This is mid-range in cost. It absorbs energy by flexing, crushing and splitting. Carbon Fiber – This is the most expensive material. It’s also the lightest. Energy is absorbed and dispersed upon impact. On the inside of the helmet you’ll find a liner made from expanded polystyrene, or EPS. This is actually the same material found in beer coolers. EPS can absorb a lot of energy but, because it’s easily crushable, that energy isn’t bounced back towards your head. So even though the thought of putting a foam cooler on your head doesn’t seem like it would provide a lot of protection, it’s actually the best possible material for the job. Helmets weight anywhere from 1400 to around 1800 grams. How the helmet sits on your head will have a big influence on how heavy the helmet feels. You want the center of gravity to be around the top of your head, so the weight is evenly distributed across your down and shoulders. Modular helmets are usually the heaviest, due to the flip-up visor. Open face helmets are often the lightest, but they also provide the least amount of protection. A variety of useful features are available such as sunshades, wind resistors and communications systems. A built-in mic and speaker are often useful if you often ride in groups, because you’ll be able to talk to your other riders when you’re on the road. Plus, helmets with Bluetooth compatibility allow you easily connect music players, GPS devices and other gadgets which make riding safer and more enjoyable. Technology has made helmets much safer than ever before. Some options to consider include an emergency cheek pad system. This makes helmet removal easier following an accident, reducing the risk of accidental injury from emergency personnel. Another popular, relatively new safety feature is the Multi-Directional Impact Protection System. Using slip-plane detection inside the helmet, MIPS helps reduce the rotational forces which can occur after certain types of impact. The Department of Transportation oversees these helmet safety standards, but it’s not as impressive as it may sound. Manufacturers test their own products. While they do test for the basics, such as penetration resistance and field of vision, the tests are pretty easy to pass. Plus, the tests are based on a random sampling of products. Tests include drop tests from various heights as well as multiple penetration tests which measure G-forces. Shell damage assessments are also performed. However, just because it’s a minimum standard doesn’t make it useless. All DOT rated helmets will protect your head in a crash. Be very wary of any helmet that isn’t rated by the DOT at the very least. These helmets are rated by the Economic Commission for Europe. This is the standard for over 50 European counties. ECE certification is legally required for any street-legal helmets throughout the European Union. Tests are significantly more thorough than the ECE. Using a rather complicated system, helmets are tested for rider of vision, shell strength, points of impact and more. Additionally, tests are conducted on multiple shaped dummy heads, to simulate a wide range of people. Snell certification is usually considered the best, most rigorous testing process. Pete Snell was a famous race car driver who was tragically killed in a race. After his death, the Snell Foundation was created in his honor in 1957 to advance helmet safety. Testing procedures include a variety of impact tests and weak-point identification. Each Snell certified helmet undergoes multiple testing, often with professional racing conditions in mind. Snell-certified helmets are commonly found on race tracks across the world. Your helmet needs to be the perfect fit. Proper sizing doesn’t just make the helmet more comfortable, it also increases overall safety. A helmet which is too large won’t be able to provide targeted protection. Plus, an oversized helmet is more likely to slip off your head entirely during an accident. Find a soft measuring tape, such as one used for tailoring. If possible, you’ll always want to enlist a friend to help you read the tape, as the numbers you need will be against the back of your head. Wrap the measuring tape around your head at about half an inch above your eyebrows. Keep the tape above your ears. It should go around the back of your head at the largest point (picture an imaginary line from between your eyes extending to the back of your head). The measuring tape will tell you your head size. You’ll have to compare that number to the sizing chart related to the helmet you want to buy. Each manufacturer uses different sizing, so you’ll have to check the relevant chart for each helmet you’re interested in buying. Now you’re ready to try on the helmet. When worn, a motorcycle helmet should fit squarely on the top of your head. The top of the eye port should line up just above your eyebrows. Keep in mind, a motorcycle helmet which fits correctly will actually feel a bit stubborn to slip onto your head. However, it will loosen up over time. When worn, there should be enough space to slip a finger in-between your face and the helmet. There should be no feelings of pressure against your face. If the fit feels just a little off, try adjusting any internal cheek pads. Absolutely! All motorcycle helmets are designed to be replaced after any type of impact occurs. Even a small accident will alter the composition of the helmet and can result in significant problems which are invisible to the naked eye. Finding the right motorcycle helmet can literally be a life and death issue. Remember, no matter how comfortable you are on a motorcycle, never ride without a helmet. The risks are just too great. Fortunately, finding a safe, comfortable and affordable helmet is easy with our guide. With the right helmet, there’s no limit to the fun you’ll have when riding!